This weekend we are back with another dose of wrestling goodness which shall see us travel to Darlington on Friday night. That is followed by a trip to Leicester on Saturday before a final stop on Sunday to Tonbridge in Kent. Let's get Ready For The Weekend! We kick off the weekend on Friday night when TIDAL Championship Wrestling return to The Dolphin Centre in Darlington with Come Out & Play. The event is scheduled to see three of their four championships on the line. The first championship defense will be the Tag Team Championship currently held by Caz Crash and Sam Wilder of The Proven. They'll be defending against the relativity new duo of The Service's Sean Only and Daniel James.The Tag Team Championship have been fought for by a number of teams since it's inception but this is the first time that The Service have challenged. The Proven have been worthy champions, picking up a win over Go Team Sports (Ace Matthews & David Graves) at July's High Tide 2016. The Service would really like to become champions as their whole intention in TCW is to cause trouble. Holding gold would be a key component of them achieving that goal. The next championship up for grab this Friday is the Women's Championship. The champion, Violet O'Hara maybe be small in stature but she easily makes up for that in fight. She's took on all comers in recent months and in Darlington will face Little Miss Roxxy. LMS has a great foundation as she was trained by current TCW Champion, Rampage Brown and British Wrestling legend, Marty Jones. O'Hara is probably going to need all that fight she has in her this Friday when she faces LMS who will be look for her first championship reign. The third and final title being defended in Darlington is the Open Championship which is round the waist of Liam Slater at this present time. His challenger is one of the most highly regarded young stars in British Wrestling, “The Righteous” Joseph Conners. Both these men are looked upon as the next big stars of British Wrestling but for their match this Friday they will be doing things in a more traditional way. Their match will be contested under World Of Sport Rules. The match will be broken down into six 5-minute rounds. A round can be won by pinfall, submission, disqualification, etc. The first man to score 2 falls in the match will be the winner. These matches are the way that champions were decided in previous years and it seems almost fitting that a way of tradition shall decide a champion for the future. 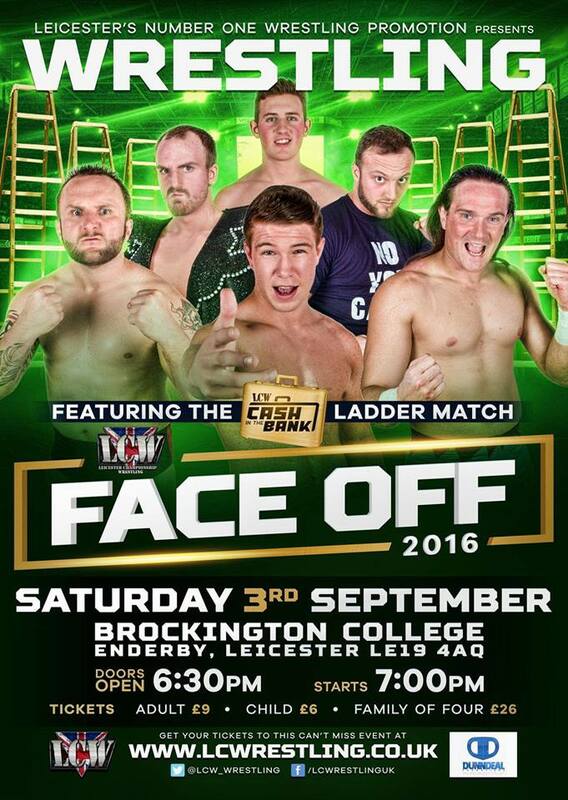 Moving on to Saturday and Leicester Championship Wrestling host Face Off 2016 at their home, Brockington College in Enderby, Leicester. This event will be the last that owner, John Shipley will be in control for as a new owner will take control afterwards. 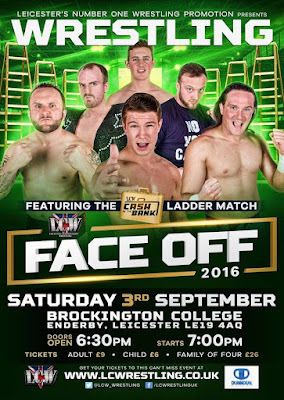 The event certainly won't be a quiet one with numerous championship defences and a Money In The Bank match all taking place. One champion who will be action twice is “The Heavyweight House Of Pain” Stixx. Firstly, he'll be defending the LCW Championship against “The Heat” LJ Heron. “The Heat” is a dangerous man who can strike from almost anywhere and with devastating effect. His spear has defeated almost everyone at some point and he'll look to use it against Stixx to win the LCW Championship. Whether Stixx does walk away still champion or not, he'll be back in the ring later that night when he joins his partner, Joseph Conner to defend the Tag Team Championship against The Alpha Brothers [Johnny Alpha & Ricky Alpha]. This is the first time that Stixx and Conners will make a championship defense together and they'll hope it to be successful against the brotherly duo of The Alpha Brothers who are gunning for the gold. Anyone who is still a champion this Saturday after their matches will have to keep one eye open for the Money In The Bank holder who will be decided this Saturday. Xander Cooper, Gabriel Kidd, Alex Gracie, Chris Tyler, Paul Malen and Jim Hunter will all participate in this year's match with a blend of experience and youth. Anyone in this match is more than capable of winning and no one is a real favoruite. Whoever does win, could well be guaranteed to be a future champion. 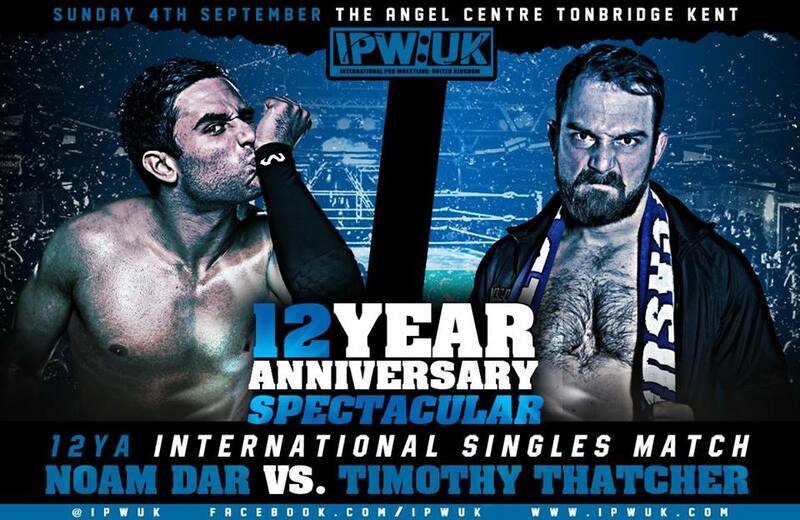 We round of the wrestling weekend on Sunday with IPW:UK celebrating their 12th anniversary at The Angel Centre in Tonbridge. The event is probably the last time that Noam Dar will be competing for IPW:UK due to him joining WWE's Monday Night RAW roster in the very near future. He'll be going up against “The British Messiah” Timothy Thatcher, the current EVOLVE Champion. Both of these men are flying high in their careers right now and this match will be a great showcase of both men will be a real treat for those attending. Back at Royale Rewards in August, Tom Dawkins and Zack Gibson and a blistering match which only ended because they reached the 20-minute time limit. While the match showed that they can match each over at ever instance, we never found out who was the better man that night. Well this Sunday we shall as these two men compete once again but this time with no time limit. This match will go until there is a winner and it's time to see how far these men can go. The main event this Sunday will see a situation that has been on-going for a number of months come to a head. Sammy Smooth has been attempting to challenge for the World Championship since winning the Royale Rewards. Be it either Joseph Conners not being in attendance or heat of the moment decisions, Smooth hasn't yet managed to have a fair match. This Sunday while he won't be fighting for gold, he'll be out to prove a point as Smooth, Scott Star and The London Riots (James Davis & Rob Lynch) will face Conners, Jimmy Havoc and The Swords Of Essex (Paul Robinson & Scotty "Essex" Wainwright) in an 8-man no disqualification tag team match. To say there are a lot of variables and opportunities in this match would be an understatement. While Smooth will be looking to get a win over either Havoc or Conners, London Riots could get themselves a shot at the Tag Team Championship if they manage to get the win over The S.o.E. While this Sunday is a celebration for IPW:UK of the previous 12 years, it could also show us where the future is heading. Cuban Heat (w/ Ricardo Rodriguez) vs ?? ?